That was probably not the best executed plan in the history of plans. Who could have predicted that the most powerful warlock in town would see through Sabrina’s fake ghost plan? Fake ghost play never works. Take it from Hamlet, kids. Well, it works on Sabrina herself pretty well, actually. 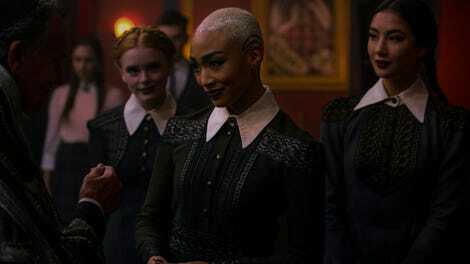 The whole debacle is a reminder that Sabrina is pretty under-resourced in her fight against Father Blackwood, and more broadly, against Wardwell. It doesn’t occur to her to question her own vision, and Zelda doesn’t take seriously that Sabrina believes the vision is real. There’s a fundamental miscommunication that has to happen here for Sabrina to go forward with what is ultimately a very flawed plan. Either it’s going to work for you that Zelda is so distracted by her wedding that she doesn’t listen to her niece, or it’ll seem like a contrivance that Zelda wouldn’t be alarmed that her niece is seeing visions of her dead father. At bare minimum, shouldn’t she be concerned about who could be sending the vision? The reaction she and Hilda have to Constance visiting them is so laissez-faire that it suggests they’re quite acclimated to having to deal with potentially menacing visitors who are themselves the instruments of sinister people. Speaking of Hilda, did anyone guess she had it in her to take the step Zelda wouldn’t and kill off Shirley Jackson, the Spellman family’s nemesis? Those were really Chekhov’s cookies. As soon as she encourages Shirley to eat one, you’re reminded of all the times you’ve seen Hilda baking throughout the show. Why that specific food, in that specific moment? Why, so the almonds will cover the taste of cyanide, of course. And despite Zelda’s more or less constant mistreatment of her, there’s clearly a bond that has kept these two together for as long as this. 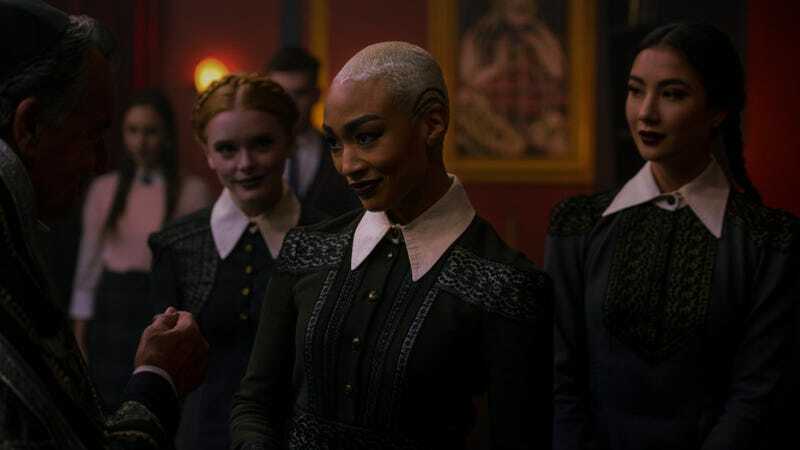 Whether that bond can survive Zelda’s marriage is a bigger question, but Shirley Jackson is clearly not a very worthy adversary for the Spellman sisters. It has been a rough couple of weeks, to be fair. His boyfriend died (though mysteriously off-camera—do we really believe Luke is gone?) and he accidentally ingested his own familiar, which then mind-controlled him into murdering the Anti-Pope. In the plus column, the Anti-Pope seems to have been a real pervert, so it doesn’t seem like a total loss. I took some quick notes during his introduction, and words he used to describe teenagers included fine, supple, fresh, pure, and potent. It’s possible Father Blackwood did the world a favor on that one. Plus, the in-joke casting of Ray Wise, who played the Devil on the gone-too-soon Reaper, is just enough to make you think the Anti-Pope will be sticking around for a few episodes. Alas, he’s quickly killed off, and as the show speeds off into the latter half of this second batch of Season 1 episodes, things are looking increasingly dire for the Spellman family. Sabrina is out of the Academy, Ambrose is in prison, and Zelda is trapped in marriage to a man whose ideas about romantic partnership seem to have stopped evolving somewhere in one of the more dire MRA-infected corners of the Internet. This show is not subtle about its gender politics, but they’ve never been more extreme than in this episode, which pairs Blackwood’s retrograde manifesto with Sabrina’s father’s far more progressive one. Which is still two men debating the fate of women, but at least in the case of Sabrina’s father, his goal is to share power rather than consolidate his own. Maybe Hilda has some really good plans she can share? Someone needs to save the day here. Come on, has anyone ever shaved onscreen without cutting themselves? Same for chopping vegetables. Really enjoyed everyone’s attempts to pronounce the phrase “Anti-Pope” naturally. Someday I hope to be as viciously indifferent to social niceties as Prudence, whose response to Sabrina saying “Hey, Prudence” is to stare at her and then walk away. “Marriage is a walk down the primrose path towards a woman’s destruction. It’s nothing else than the complete obliteration of a woman’s personhood.” Wardwell should really consider selling greeting cards. Do we trust Nick now that he got himself expelled just to help Sabrina? I rewatched a scene where they said “Enoch” with closed captions on just to make sure I was spelling it right in my notes, and then I didn’t mention his name above, and now the character is dead. So, Enoch.